If you have a bunch of blocks at your disposal, it would be worth it. I've ruined several 390 FE blocks trying to get them to go to a 4.130" bore, even after they sonic tested thick enough. In most cases, it's just not worth it, trying to nail it on one particular block. My little 354C project made almost 620 hp on a 4.015" bore with a 2.190" intake valve. I actually do have a bunch, prob at least 8, be cool to sonic a few, thought about buying cheap one off ebay. But I am done with the stock stuff, just to weak for what I need. However with that said, have enough parts to build my pro stock motor, be fun to see a stock block be able to go .060. If you're looking for a sonic tester that's solid and doesn't cost a huge amount of money I'd recommend the Dakota Ultrasonics. I've had one for more than 10 years and I've tested a lot of blocks. One VERY important thing to do is to ALWAYS calibrate the tester on the block that you are testing. If you do this the results will be accurate down to a few thousandths very easily. 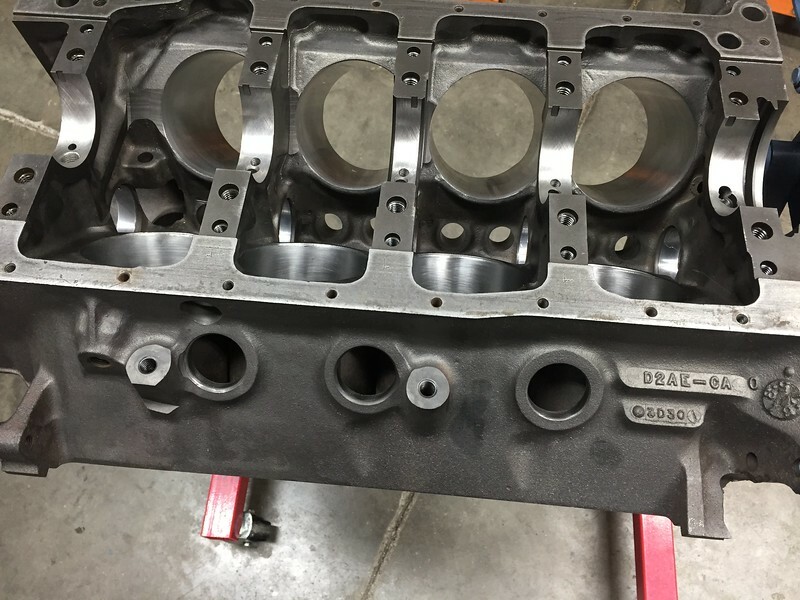 What I think you'll find when you run through your lot of stock blocks is that every block will be similar in that they are all thin on at least a few cylinders irregardless of the casting dates etc. I need to re post the write up from when we did the big Ford Block Summit a number of years ago. The idea was to have people come and bring along any blocks that they want to have sonic tested, run through all of them and then hopefully come up with a production big block that could almost without question work for large over bores and be superior. I sonic tested 35 blocks that day ranging from a C8VE to D9TE, Boss 429, CJ etc. NONE of the 35 blocks would go to 4.500 bore and have a cylinder wall thickness greater than .060 non thrust. Most would do ok to 4.440 and have about .080, some would be down to .030 at that bore size. With that said if a perfect block casting could be found it is possible for one to go 4.500 and have .080 but it might be one in a few hundred who knows. I well remember the BBF Summit Dave and the results were interesting. Perhaps you could post the results here (you had a long summary IIRC) if Brent agrees. What I took away that even with the alleged thick-walled 385 blocks, they aren't quite as thick as most believed in the non-thrust area regardless of what one believes. And yes, whether 351C or 429-460, a few cylinders will be quite a bit thinner yet the blocks will be usable. 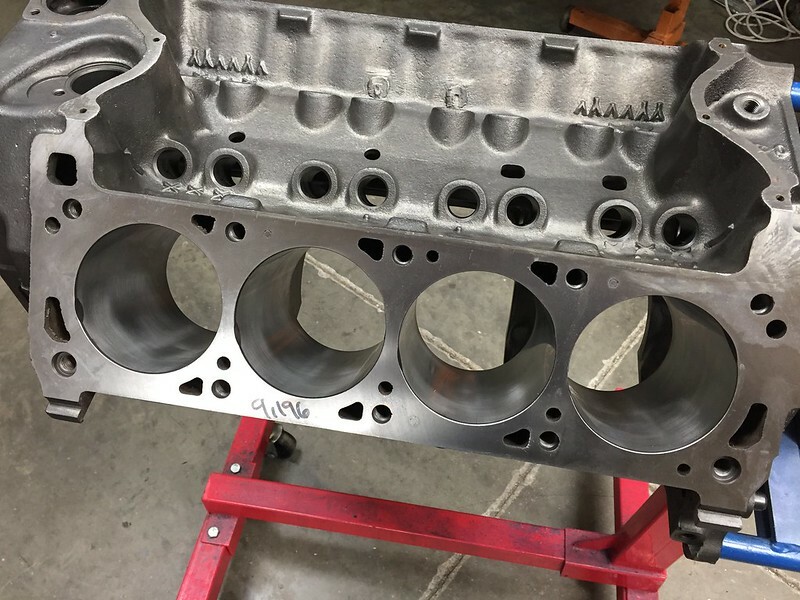 Oddly, I have found (w/o any degree of testing as you did) the 351W blocks (pre-roller lifters) have more uniformity and wall thickness overall than any other modern Ford engine. Your study I think helped point out why. W's of all CID's were first cast in 1962 (I think) when Ford' s engineers weren't concerned about light weight, less iron, thin wall casting techniques, etc.) So perhaps the original molds or their specs carried over all the years later. The much later 351C and 429-460's then perhaps suffered a bit from the thin-wall mania. I don't care what y'all post, as long as it's family oriented. Brent speaking of blocks, any word from the machinist? It's already been align honed and he cut your block and another Cleveland for a one piece rear seal for me on Saturday. Your block was parked in front of the surfacing machine when I was there yesterday. Decks will get cut and then it will be honed and then we will be ready to order pistons and get on with the show. Gonna pick up Jim's block today. It cleaned up at 4.005". Will be ordering slugs/rings today as well. I'll post pics when I get it prepped. 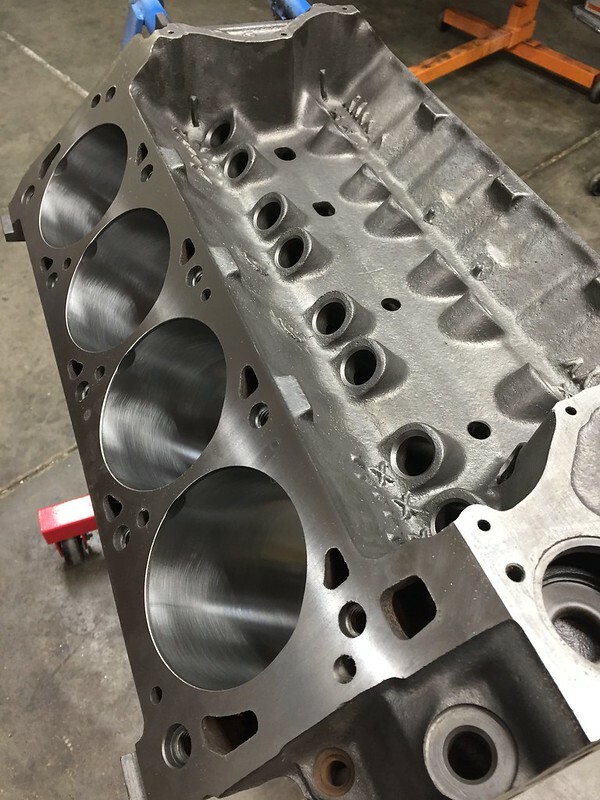 Bottoms of cylinders will need deburred, as well as some other prep work. This block (knock on wood) has been nothing but a dream to work on. Bores cleaned up at 4.005". Decks cleaned up at 9.195". Cam bearings went in without fuss, cam spins like 'buttah. I dropped Jim's crank off at my grinder for some touch-up work. The #1 main journal had .0006" of taper on it so that needed to be fixed. I deburred the cylinders at the tops and bottoms and ran a dingle-berry hone through the lifter bores to put a nice finish on them and take out any burrs from where the block was cleaned up. Tomorrow it will get final washed and primered/painted. Jim wanted it to be painted Oldsmobile gold. Just kidding Jim. 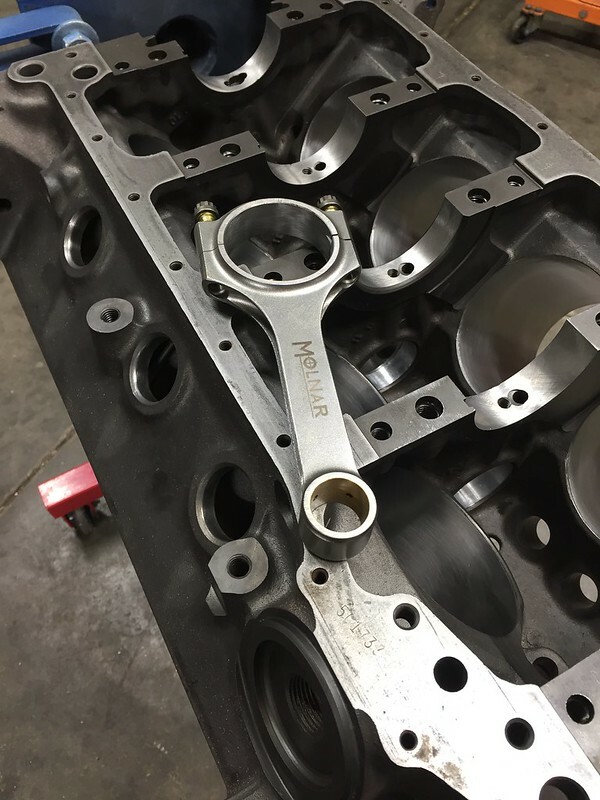 If you have a sharp eye, you will see that the block has been cut for a 1-piece rear main seal.